At Edinburgh DJ Hire we offer professional versatile musicians to play at your events. Having a live musician can really add a unique flavour to your party and give your event the X factor! Felix started to play saxophone at the age of 14. He quickly established himself as a very flexible sax player through the whole of the UK. He started with UK Jazz and Blues bands but quickly got in to the club scene and started an absolutely new experience. 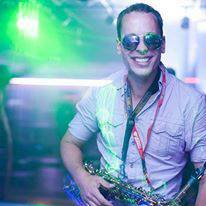 Playing alongside DJ's, he has quickly established himself as one of the top club sax players in UK. Performed with artists such as; Otis Grand, Li'l Jimmy Reed, Dave Pierce, K Klass, Mylo, Jack Beats, and Hollywood legendary actor Bill Murray etc. At the moment he is touring around the UK's biggest nightclubs and venues cooperating with the newest freshest nights including : Phreak Unique, Funk Agenda, Paradiso, Rendez-vous, 3sixty, Lulu etc. Felix is also part of the very successful electric dance trio Seedy Soundsystem, touring all around the UK. In 2012 they became the first electric dance band to play at the top of the UK's highest mountain Ben Nevis. Proving his versatility is his involvement with Country Americana 8 piece power band Red Pine Timber Company. They are due to release their debut album Summer/Autumn 2013. Felix is one of the most flexible sax players and every show is 100% nothing less.